Our 100 count heavyweight clear holder is the perfect size to fit in your office drawer and balance economy and function. Extra durable heavyweight sheet protectors provide permanent storage for frequently used materials. 11 x 8 1/2. Photocopies won't stick. No sheet punching necessary. Acid-free. Clear finish. 100/BX. 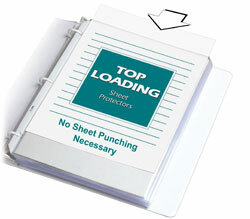 C-Line's most popular top loading sheet protector, and for good reason. Sheet Protector Special Features: Acid-free, archival quality sheet protector eliminates photocopy transfer and has clean hole punches making it easy to load into a three-ring binder.